"On a bustling alley corner in the Tenderloin, Turtle Tower is easily missed – unless you happen to know its chef and owner Steven Nghia Pham, who appears to know everybody walking past. The best way to describe Steven's take on pho is fresh. He buys produce from farmers' markets down the street, free-range chickens, insists the beef be hand sliced and buys noodles made fresh that day. The noodles in your bowl were probably made a mere three hours before you take the first bite. It takes a confident chef to name his restaurant after Hanoi's famous landmark Thap Rua, or Turtle Tower. Steven says he wanted his customers to know where his restaurant stands among the many pho shops of San Francisco-and his instincts were right. Turtle Tower's specialty is its broths. Strictly northern-style, the soup comes with no side garnishes or bean sprouts, common accompaniments of Southern and Americanized pho. Steven developed his recipes from the food his mother cooked for him and his siblings, not the recipes his grandfather culled as a gourmet French cuisine chef in Hanoi. The Nghia family has been in the restaurant business since his grandfather opened up a French restaurant in the 1940s, and his brother still runs the family restaurant today where their specialty is the traditional soup and rice dishes that Steven thought would sell in San Francisco when he opened Turtle Tower in 2000. Turtle Tower's gift to the wide world of pho is in the range of flavors in his broths; no two pho are alike. For a deep, smoky soup, the Pho Tai Lan, stir-fried beef noodle soup, is full of crispy vegetables and beef. 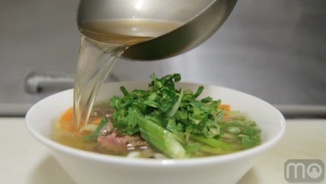 The broth of Pho tai nam, rare and well-done beef soup, is gingery with citrus overtones. Pho ga, chicken noodle soup, is light and simple with all sorts of chicken goodies to munch. My lunch buddy and I each got a soup and then split the imperial rolls with vermicelli. This dish is great finger food: wrap noodles and a roll (chock full of mushrooms, carrots, noodles, and crab meat) in a cocoon of lettuce then dip in a vinegar fish sauce. Space is at a premium; you and your lunch buddy may be seated right next to businessmen slurping pho over the newspaper, so while this may not be the place for a romantic rendezvous, it's great for a quick, cheap, and scrumptious lunch."